Trump’s vice presidential pick Mike Pence is a creationist. In 2002, Mike Pence asked that religion be taught in public schools. I’ve written a word or two about Donald Trump, as you might imagine, but not much on his vice presidential pick, Indiana Gov. Mike Pence (except to say, unshockingly, that he is a climate change denier). You know anyone picked by Trump to be his running mate almost certainly will have a problem with established science, of course, but it turns out Pence is also a young Earth creationist. And one with a lot of conviction about it, too. In 2002, while a congressman from Indiana, he gave a short speech on the floor of Congress denying evolution, and used quite a few misleading, if not outright false, claims. There’s a lot to debunk here, but let me point out some choice bits. Charles Darwin never thought of evolution as anything other than a theory. He hoped that some day it would be proven by the fossil record but did not live to see that, nor have we [emphasis mine]. Oh my, Gov. Pence, yes we have. But no one is pointing out that the textbooks will need to be changed because the old theory of evolution taught for 77 years in the classrooms of America as fact is suddenly replaced by a new theory, or I hasten to add, I am sure we will be told a new fact. When we learn new things in science we do generally say, “We’ll have to rewrite the textbooks,” a phrase used so much it’s actually a cliché. And also it will be taught as fact if it truly is one, because that’s how science works. It grows and learns from new evidence. Don’t you think you should change your mind about a topic when new, contradictory evidence is brought forth? And now that we have recognized evolution as a theory, I would simply and humbly ask, can we teach it as such and can we also consider teaching other theories of the origin of species? Evolution is taught as a theory. And also a fact, because it’s both. As for “other theories,” hang tight a moment. Like the theory that was believed in by every signer of the Declaration of Independence. Every signer of the Declaration of Independence believed that men and women were created and were endowed by that same Creator with certain unalienable rights. The Bible tells us that God created man in his own image, male and female. He created them. And I believe that, Mr. Speaker. Ah, the old “America is a Christian nation” gambit (and note that many denominations of Christianity have no problem with evolution). But that’s false. And that has nothing to do with whether evolution is true or not. And it is. And I also believe that someday scientists will come to see that only the theory of intelligent design provides even a remotely rationale explanation for the known universe. Oof. Well, ID is not a theory, it’s just warmed-over creationism, and is now actually illegal to teach in public school because it’s religion, pure and simple. 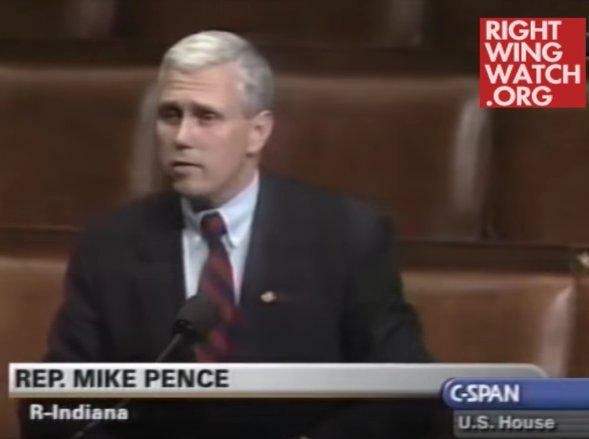 It was made illegal in 2004, two years after this speech, but ID was purposely constructed to be modified creationism since its inception (I’ll note that Pence has made similar anti-evolution claims in the years since, too). I feel that at the very least, a vice presidential candidate should uphold the Constitution, especially the First Amendment. Not that Trump appears to have any desire to want to, either. That makes them quite the pair. I hope that come November, they can be unemployed together.